Following less-than-glowing reviews of its latest MacBook Pro from US watchdog group Consumer Reports, Apple has released a fix hoping to address concerns over the laptop's inconsistent battery. Currently available through Apple's Beta Software Program before releasing to the general public, Apple's MacBook Pro update fixes a bug in Safari that the company claims caused an all-over-the-place battery rating during Consumer Reports' testing procedures. In a statement to Consumer Reports, Apple claims the bug triggered when the outlet's reviewers shut off the caching feature in Safari (which saves website data locally to improve browsing speed) when testing the laptop's battery life. In the same breath, Apple criticized this method for failing to reflect typical usage by average consumers. This bug drained significant amounts of juice, leading to the consumer watchdog clocking battery life results everywhere from 19.5 hours to a scant 3.75. 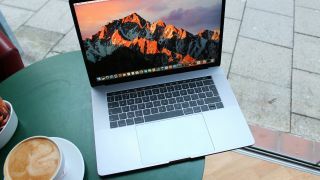 Despite rating highly in display and performance, the randomized battery life subsequently cost the MacBook Pro the covetous "Recommended" rating from Consumer Reports – the first of Apple's notebooks to miss the honor. Following Apple's Beta Software fix, Consumer Reports claims that the MacBook Pro now rate consistently higher for battery life on the re-test, and will report back with new scores once the results are complete. Though it seems Apple has nipped the wonky battery issue in the bud, the MacBook Pro isn't out of the woods just yet. The laptop's power source could still be inherently problematic, with reports claiming Apple swapped in an underwhelming battery at the last minute to make deadline. Additionally, the company had already submitted a separate fix last month nixing the laptop's wildy inaccurate "battery life remaining" meter. MacBook Pro owners also still speculate on official forums where the short battery issue stems from – with little consensus on one clear culprit. Given that Apple's perceived problem resulted from Consumer Reports' particular testing methods – turning off features average users might not touch – it's still not yet clear whether everyone owning Apple's latest laptop will benefit from the fix. Fingers crossed?